Kate Graham Heyd is a bold painter who works in oil, watercolor and gouache. Her oils move between completely abstract to abstract expressionist landscapes while her watercolors and gouache pieces are completely abstract in form. In both mediums she expresses herself with intense colors and strong marks. Although influenced by the impressionist and abstract expressionist movements, her work has a compelling originality that makes it unique. Kate feels that in her life, change is inevitable, but nature’s beauty remains constant. She feels a connection with the earth that comes from the surrounding woods and lakes, the expansive skies, and the continuous ebb and flow of the ocean. Painting allows her to share her view of the natural world and the beauty that she finds there. By swapping the colors that she finds in nature, she offers the viewer a new perspective and a realization that change can be a positive opportunity. 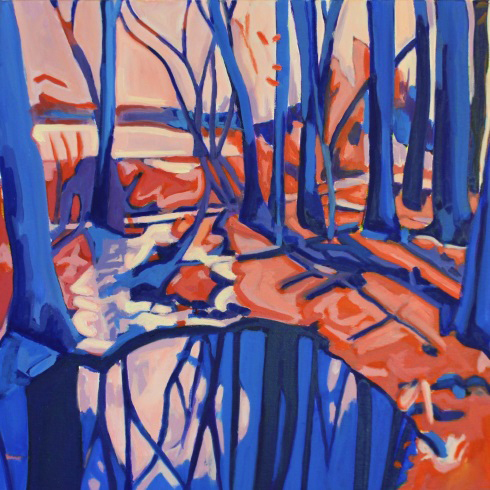 In her work, she endeavors to creatively convey her connection with nature, hoping that the viewer will identify with the painting and for that moment, be surrounded in color and light.